The weather is getting warmer and a young man’s fancy turns to…the barbecue! Why should the blokes have all the fun, so I say this book is equally for the girls. This is a chunky book filled with photographs that make you want to rush out and light the barbecue even if it’s raining. 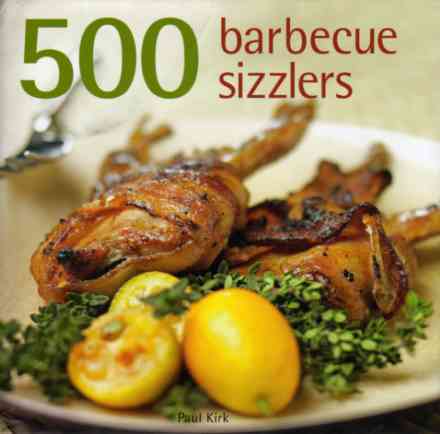 Paul Kirk is a seasoned (yes, I can say that as it’s a cookbook review) griller who has already written a few other books on the subject, so you know that the recipes are as good as the pictures suggest. Let’s start with the basics. Paul gives us advice on smoking meat and setting up your smoker as well as tips on marinades and rubs. There is plenty of information about the cuts of meat that work best on the barbecue, and I am very pleased to see a table of approximate cooking times. Undercooked meat is a real hazard for guests at a barbecue so read the table and follow the cooking times given with each recipe. The chapter called Sizzling Appetisers has a good choice of light snacks to nibble whilst waiting for the serious barbecueing to begin. Cheese-stuffed Mushrooms or even Grilled Oysters. Now, how posh is that? Each chapter ends with a long list of variations for each recipe: for example, Grilled Quesadillas has four alternatives to the basic recipe. 500 Barbecue Sizzlers is divided into chapters by type of meat to be grilled but there are sections for vegetarians, with some grilled vegetables and a few salads. There are also lovely fish recipes like Brown Sugar-cured Salmon, Hot Grilled Trout and Mexican Grilled Red Snapper. Ok, OK, boys, let’s talk about the meat! There is plenty of it as that’s the nature of this type of cooking, but there is something for every taste. The days of big slabs of chewy protein are gone, to be replaced by Barbecued Quail, Peach-Ginger Turkey Cutlets and Tandoori Rack of Lamb. There are still some large cuts of meat to be found but they are given a lighter presentation. Grilled Top Rump with Aioli and Simply Grilled Sirloin with Béarnaise Butter would tempt the most committed steak eater, but it wouldn’t look like a meat fest if served with salads and grilled veggies. 500 Barbecue Sizzlers has marvellous recipes to suit all occasions and would be a perfect gift for any outdoor grilling enthusiast.